« Barangay Datu’s Para Kay Teddy Casiño! the voices of millions of marginalized, disenfranchised, disadvantaged, oppressed common Filipino citizens who have given their (unfortunately, non-newsworthy) support for Teddy throughout the campaign period – all ready to show us how Teddy can and Teddy will. 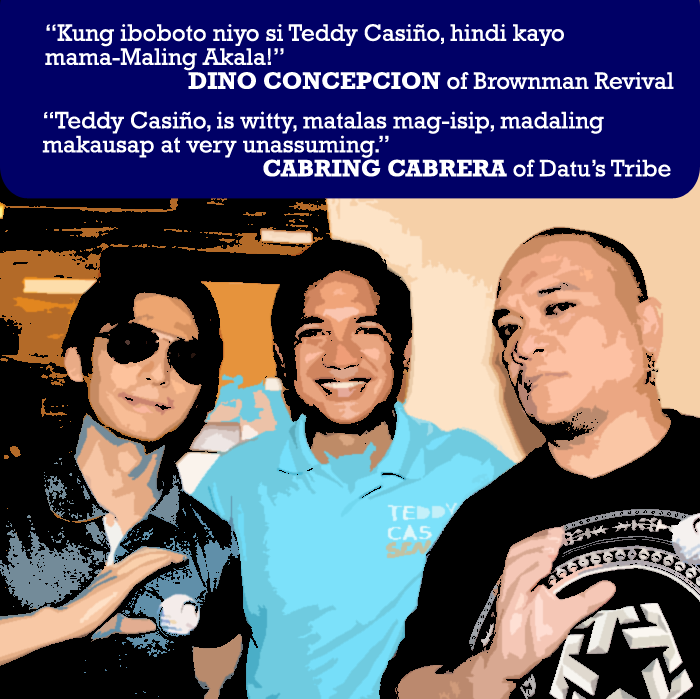 Teddy Casiño will be a fresh face in the senate and his will be a game-changing presence for Philippine politics. Still, he’s no new breed of political animal. Many other like-minded people before him have espoused the same “radical” ideas, but the system has always been quite effective in keeping people’s minds in check by conditioning the same to hate, ignore, laugh at, and/or fear the kinds of ideas that people like Teddy bring into play; by conditioning us to believe that the best path towards achieving meaningful changes is to keep on voting for the same people who actually prevent any meaningful changes from truly happening. So, will Teddy Casiño be a threat? YES, he will, but only to the interests of the privileged few who continue to feed off of the system –those SAME NAMES, SAME FACES, those SAME PERSONALITIES who keep subjecting us to the SAME IDEAS and the SAME PROMISES that serve only to worsen and perpetuate the SAME PROBLEMS. He will be a threat to the TRADITIONAL POLITICIANS – those men and women who continue to secure obscenely bright futures for themselves by perpetuating the conditions that continue to keep millions of common Filipinos miserable, desperate, and uninspired. This entry was posted on 05/12/2013 at 12:52 pm and is filed under De-Face the Music with tags artist's rights, datu's tribe, galit kami sa baboy, May 13 elections, Teddy Casiño sa Senado. You can follow any responses to this entry through the RSS 2.0 feed. You can leave a response, or trackback from your own site.